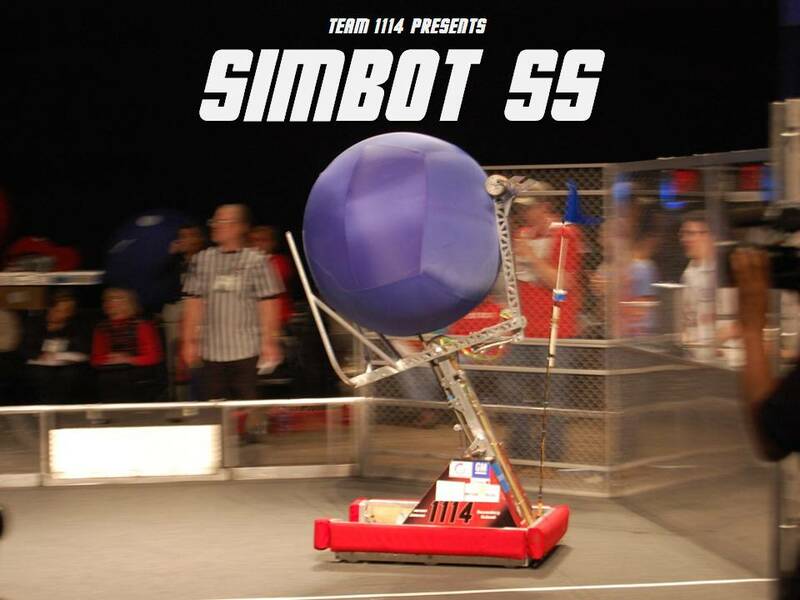 Team 1114’s 2008 robot, Simbot SS. By far our fastest and simplest creation to date. What powers drive? What speed? Is the robot underweight? Also, can you explain the teaser? Those who haven’t seen the video of this thing should check it out on the blue alliance. 1114 has done it again. Look out Einstein, here they come. How much feedback to you have to control the drive train? The arm/grabebr mechanism? How do you control the Hybrid mode? What commands does the Robo-coach (if used, but I assume you do) give? Thanks, and congratulations on building an incredible robot. I hope I / we can go to Atlanta this year, if just to stare at your (and others, of coutse) robot(s). All the same. That things amazing. can anyone enlighten me on how their shooter works? all i can tell from the pics is that its very thin and pokey. Me: Karthik, can I see the robot? Like others have asked, please elaborate on your shooting mechanism. If you can share close pictures of your mechanism, it would be much appreciated. Its an understatement to say that any team probably could have built this thing/similar design had they seen this from day 1 of build season. Thanks for the amazon link. I just preordered a couple of books and its Much cheaper. The shooter is wound up using surgical tubing. When the arm is pulled back, the surgical tubing is tensioned. If I remember right, I think they used a dog gear as a firing mechanism… but that may be someone else. Worked very effectively though and their drivers were about as good as it gets). I would just like to say great job to you and your team. This robot definitely wow-ed me right off the bat. You guys really are a top notch team and I have the upmost respect for you guys. Good luck in the rest of your regionals, and i’ll be pulling for you guys at championships to go all the way, you definitely deserve it. Is this the year simbots win Einstein? This is definitely my “why didn’t I think of that” robot for this year. Watching this thing on the webcast two expressions came to mind. How many over per round did they do? I think I’ve seen them do 7 in one match (actually this match), my guess is that their average per match is closer to 4-5. We have two encoders (one on each side, 64 ticks per revolution) and a gyro for feedback on the drive system and there is a 10-turn pot mounted on the arm. The information from the base is fed into a positional system we use to keep track of our location on the field and react appropriately. The hybrid modes focus mainly on informing the robot what “lane” to be in on the straight-aways (for now! ).